TechSpot: 'Your Computer Ran into a Problem and Need to Restart'; Windows 8 Installation Fails on VMWare Workstation 7 with This Error! 'Your Computer Ran into a Problem and Need to Restart'; Windows 8 Installation Fails on VMWare Workstation 7 with This Error! "Your Computer Ran into Problem and Need to Restart". 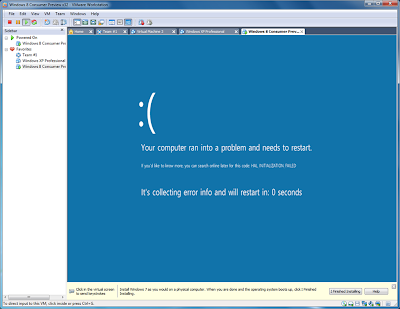 You cannot try Windows 8 on VMware Workstation 7! You have to install latest version of VMware, VMware Workstation 8. You can download 30 days trial of VMware WS 8 from here.